A survey, conducted earlier this year by Intellimon, in partnership with the University of Bradford, polled over 4000 online businesses. - While 67% of respondents use social media platform Facebook to promote their business, an average of only 29% find the platform effective in any way for driving traffic to their business website. Commenting on the report findings, Intellimon CEO Paul Smithson said, "We were genuinely shocked by some of the results across several areas; Social Media, Training, Outsourcing and Demographics sections all threw up some very unexpected results. It's a real eye-opener, even for experienced online marketers." - Despite the prominence of older businesspeople online, it was actually the youngest age-group (18-43 years of age) [What kind of demographic segment is that" What does an 18 year old have in common with a 43 year old?] 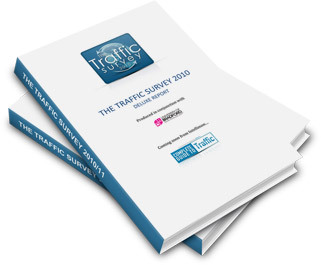 who reported the highest success rate with their traffic marketing. 25.6% of respondents in this group reported their success rate as "good" or "excellent" compared with a spread of 9.8% to 16.3% across the remaining age-groups. - Despite "Search Engine Traffic" being reported as the most important traffic generation tactic, an alarmingly low 62.8% [this is what we call alarmingly low?] of respondents perform SEO only monthly or less frequently. - Refreshingly, across virtually every measure, training was acknowledged as being crucial to the success of an online business, with businesses training regularly and investing significant sums in different training materials. If you care, get the entire study here.